Don’t let the Department of Energy walk away from its SSFL cleanup commitments! 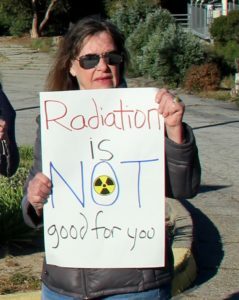 RCC co-founder Holly Huff demonstrates against Boeing’s tours of the contaminated SSFL site. THANK YOU to everyone who submitted comments on DOE’s DEIS. The deadline has passed and hundreds of comments were submitted. Next up will be the Department of Toxic Substances Control (DTSC) environmental review for the cleanup, which is due out this summer 2017. That will be the last official time for the public to weigh in on the cleanup. We’ll be sure to let you know when, where, and how to comment! The Department of Energy (DOE) is attempting to break its obligation to clean up all of the nuclear and chemical contamination at the Santa Susana Field Laboratory (SSFL), proposing instead to leave as much as 99% of the contamination not cleaned up. Click here to find contact information for your Congressional, State, and City representatives. Let them know you want the Dept. of Energy to keep its commitment to clean up all of SSFL’s contamination. The DOE recently released a Draft Environmental Impact Statement (DEIS) that proposes three alternative cleanup plans for its operational area of SSFL. The three alternatives would respectively leave up to 39%, 91% or up to 99% of the contamination on site, where it can continue to migrate and put nearby communities at risk. This is especially troubling because the DOE is responsible for cleaning up Area IV of SSFL, where most of the radioactive contamination is located. The public has until March 14th to send in comments on the DOE’s DEIS. We have created a sample comment here that you can modify and submit. If you would like to read and download the DEIS, you can do so by clicking here. Background information and key points about DOE’s DEIS for SSFL are listed below. In 2010 the community celebrated a tremendous victory when both NASA and the Department of Energy (DOE) signed an Administrative Order on Consent (AOC) with the state’s toxic regulatory agency, the Department of Toxic Substance Control (DTSC), that requires NASA and DOE to clean up their portions of SSFL to background levels of contamination. Unfortunately, the DOE’s recently released Draft Environmental Impact Statement (DEIS), which is over 2 years overdue, proposes to break the legally binding commitments of the AOC and walk away from cleaning up large amounts of radioactive and toxic chemical contamination. DOE proposes three alternatives that would leave 39%, 91% or even 99% of the contamination not cleaned up. All of the alternatives violate the AOC cleanup agreement that DOE signed in 2010. DOE’s first proposed option claims to use the AOC’s lookup tables, but proposes exempting nearly half a million cubic yards of soil it admits is contaminated from cleanup and to leave it in place instead – despite a requirement in the cleanup agreement that no “leave in place” alternatives be considered. DOE justifies the exemption on its hope that the contamination might lessen on its own 70 years from now and on potential exemptions that in fact violate the AOC’s very limited exemptions. DOE claims that the second option involves cleanup to suburban residential standards, but it has manipulated that standard to be 100 – 1,000 times more lax than the true EPA suburban residential standard. DOE should not have included risk-based estimates, because the AOC agreement is to clean up to background. Yet even without the AOC requirement for cleanup to background, longstanding EPA guidance says that DOE should rely on local zoning for setting the cleanup standard, which at SSFL is agricultural which would be sufficiently protective. DOE ignores that requirement. If suburban residential is to be used, as they claim they are, it needs to be the true standard, not one hundreds of teams weaker. DOE’s third option–to clean up to a standard of 25 millirem per year, the equivalent of a medically unnecessary chest X-ray every month of your life–also violates the 1995 DOE-EPA Joint Policy that all DOE sites must be cleaned up consistent with EPA Superfund guidance, which has declared 25 millirem to be non-protective. The option also involves averaging contaminated areas with cleaner ones, rather than cleaning up anything over the cleanup level, which is also barred by EPA guidance. DOE claims that a protective cleanup poses undue harm to the environment and that the contamination poses little risk. However, the contamination poses a very significant risk to public health in all DOE’s options, risks that far outweigh environmental concerns which can be mitigated. Also, most of the cleanup is occurring in areas that are already disturbed by DOE activities. DOE was not concerned about the environment when it was polluting the land so badly, nor about trucks when they were driving up to SSFL every day bringing hazardous loads of spent commercial nuclear fuel from around the country. DOE’s draft EIS fails to acknowledge that the AOC is a legally binding agreement, which DOE cannot choose to ignore unilaterally. DOE as the polluter doesn’t have the authority to decide how much of the mess that it made is going to get cleaned up. The decision rests with DTSC for the chemicals under the Resource Conservation and Recovery Act, even if there were no AOC, and for the radioactivity under the AOC, which gave the authority to DTSC. The DOE states numerous times in the DEIS their desire to defer to “natural attenuation” (leaving much of the contamination in place to supposedly deteriorate over time) which they say would take at least 70 years. This is concerning, because it would mean that contamination would have remained on site for more than a century from the time it was created, constantly leaking offsite. Leaving the site contaminated for most of the rest of the century also raises serious questions about future use, given talk of converting the remediated site into a park, which thus couldn’t happen with the left-in-place pollution. DOE failed to consider routes for the transportation of contaminated soil that avoid neighborhoods. DOE failed to consider, for example, alternative truck routes as well as the railroad station less than a quarter mile north of the site that is able to ship out contaminated soil. The station is accessible by routes that do not pass by any residences. Instead it only considered trucking the waste to a railroad line 60 miles away. All of DOE’s proposed actions will result in dangerous radionuclides and toxic chemicals remaining on the site where they can continue to migrate and impact nearby communities. Future site visitors could also be impacted by contamination left in place that should be remediated before any public access occurs. Thank you for all of your efforts to make sure that the nuclear and chemical contamination at SSFL is fully cleaned up!